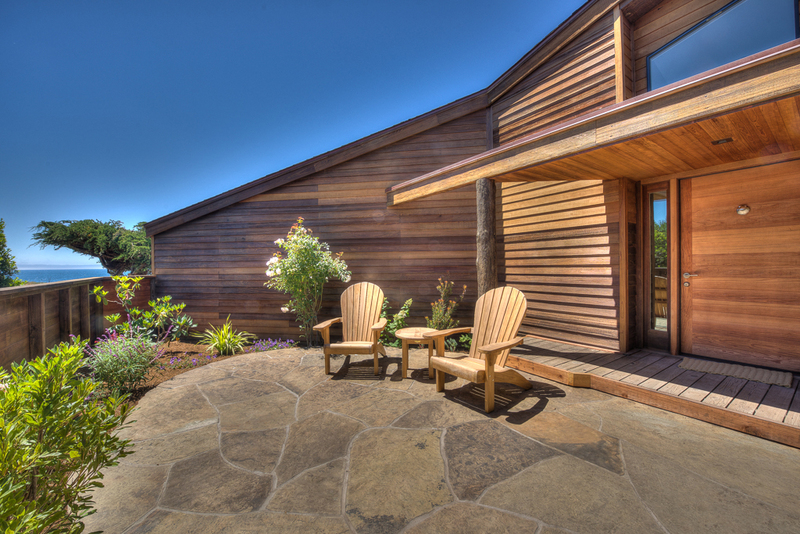 Beautiful, completely renovated, secluded and tranquil home located at the end of a cul-de-sac at one of Sea Ranch’s most coveted locations. You can’t get much closer to the ocean than this! Unobstructed ocean views from every light-filled room. Only steps away from picturesque Shell Beach, the coastal walking trail, and a panoramic bluff overlook where you can take in the sunset. Well-chosen, quality furnishings with a style that’s contemporary and also warm and comfortable. Two master suites with king beds at opposite ends of the house, plus living room sleeping accommodations, provide guests a great deal of privacy. Meticulously maintained and cleaned, this pet-free home is ideal for those with allergies and other sensitivities. Two large enclosed patios, both with lovingly maintained gardens, plus an ocean-view deck and hot tub, give multiple options for being outdoors. Spacious and well-equipped gourmet kitchen. Warm and inviting living room with wood ceiling, gas fireplace, spacious window seat, game table, large TV, and a variety of comfortable seating options.